When Lucy, the wife of a talented young baker named Tom, was diagnosed with Coeliac disease, Tom couldn't bear for her to miss out on all of her favourite baked goodies. With passion in his heart and a rumble in his tummy. Tom created a selection of truly scrumptious gluten and wheat-free treats that he and Lucy both loved. 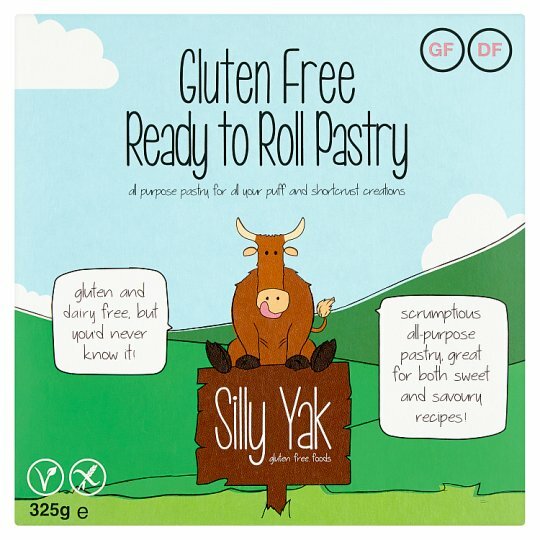 Now you can love them too with this delicious range of delights from the Silly Yak. Gluten and dairy free, but you'd never know it! Scrumptious all-purpose pastry, great for both sweet and savoury recipes! If frozen, store at -18°C., If chilled, store at 5°C., Refreezing is not recommended. Oven cook (From Frozen): If Frozen, defrost in your fridge overnight and follow instructions from chilled. Always use straight from the fridge to avoid stickiness. Generously dust your work area and rolling pin with gluten-free flour before handling.